Last Sunday, Bill Morris in the New York Times added to the recent meme that college athletics are “out of control” and need to be reigned in. 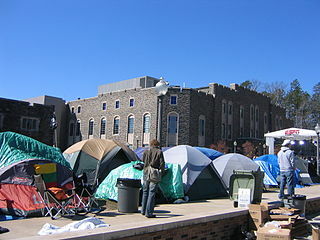 To illustrate his point he profiles the new-ish tradition at Duke University where students camp out, now months in advance, to insure entrance to the Big Game of the year: Duke vs. UNC men’s basketball. While I agree in some part that college administrations sometimes direct athletics un-due attention and resources that are probably contrary to their founding missions as academic institutions, I also cherish the act of cheering for one’s college team as a form of pure and benign community building. And I think that Morris has latched onto the wrong symbol of collegiate athletic access when he speaks of “Krzyzyewskiville.” Then again, I may be biased because I was there, in line, at the beginning. I arrive at Duke in the fall of 1982, and I distinctly remember our freshman orientation guide, a junior with spiky blond hair, asking our group if we followed college basketball. All ten of us looked around and then shook our heads. He smiled and said, “a year from now you will be big fans.” Frankly I was most looking forward to the ACC football season as our family were big Ohio State football fans, so I had watched many Big Ten football games growing up and finally wanted to see a college game in person. I didn’t even know if Ohio State had a basketball team, though Dad had mentioned once or twice that John Havlicek of our beloved Boston Celtics had played for Ohio State. We went out and chopped down our 2012 Christmas tree and put it up in the living room. Where do you think one would find such a tree in Reno? Everybody sells ’em, from the Garden Shop Nursery to Walgreen’s to any supermarket to Whole Foods for the sustainably raised and good tasting. Last Saturday night, Carol and Marcus attended the Oktoberfest Party at Sierra Canyon in Reno, where they now reside (a Dell Webb 55+ community). Here’s Carol and a bunch of old people… There was live music — think Danke Schoen and Roll out the Barrel. The couple across from us, Buck and Jan, moved here from Mesquite NV, a town of 15,000 in the desert about 75 miles north of Las Vegas. They have 8 18-hole golf courses and 133 days over 90 degrees. Everybody here is from *somewhere else,* so that’s usually the first topic of conversation. The buffet included more than one kind of wurst, cabbage in many forms, German potato salad and plenty of beer. The first round was draft Sam Adams Oktoberfest followed by various bottled beers. There was dancing and frivolity but we didn’t stay to the bitter end… we were eager to get home to the Nebraska at Ohio State football game. We watched the first quarter before leaving and “taped” the balance of the game. The Buckeyes were struggling and trailed at the end of the quarter. As you can see, they turned THAT around. We transition to another place and time in my life: Not much more than 6 actual hours later, son Eric was taking pictures at Faneuil Hall Marketplace in Boston where, in 1975, he accompanied his dad on a very early morning tree planting in South Market Street. That’s right, Eric. On a rainy October morning in 1975 I didn’t have to pry you out of bed at 4am to go with me to meet the first of the tree trucks, arriving with their Locust trees from New Jersey. You were so excited that you were dressed and ready to go when I knocked on your door. Thankfully this image is NOT indicative of the food we ate when the Carol Rector family met in Lancaster to memorialize her mother Liz, who passed away this summer. Brian grazed up north in the Mistake by the Lake while the Mainers and new Renoans joined a few Hales to sip and graze in the new Short North district between downtown Columbus and the OSU campus. The next day (after the obligatory Bob Evans breakfast *at the HOME OFFICE*) we enjoyed a buffet lunch put together by the church ladies of Grace Memorial Church in Lancaster. As a nightcap some of us enjoyed a very good Mexican snack on Route 33. The following morning we reconvened in Jackson County, OH just a few miles from the Ohio River to learn all about the Big Green Egg, with a surprising taste of FORTY YEAR OLD bourbon. Now that Marc and Brian have returned home to review (and lighten) their images, we’ve pulled together a highlight reel of the visit. It all started Wednesday night at Brian’s house: Happy Birthday Brian… and, he grilled pork chops himself. But that’s not why we were there. We stayed over because we had to get up at 4am so Brian could take us to the airport for our 6:05 flight on Southwest. (Brian and Natasza were flying later.) It was our first time on Southwest and we discovered that when we checked our bags at the curb, all we needed was picture ID… We were already in the computer with our group and number for boarding (A 49). Seats aren’t assigned, but we paid 10 bucks to get in the A group, so getting a seat of choice was no problem. How cool is that? There’s little to report on food at the airport at 5:15am (no tomato juice available) or on the airplane (just snax, thank you, and oh… bloody marys for 5 bucks each). We got to Carol’s sister’s house in Baltimore, Ohio, late afternoon and sat down for some of DeeDee’s famous Barley Soup. “Brown a pot roast real good in a cast iron skillet. Put it in your slow cooker with potatoes, onion and celery and pour a cup of warm water around, not over the roast.